In 1519 Carlos V was crowned “Roman Emperor” and ruled the largest empire since Charlemagne’s reign. His immense empire reigned not just Spain but also America and Austria. 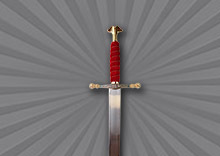 This historic sword comes with a classic red cloth handle, free name engraving along the blade and includes a mounting hand grip. The length of this sword is 44 inches, with a hilt width of 9.1 inches. It weighs 6.5 pounds.